Yesterday, I finally played my first round of the year. At the same time, I also played my first new course of the year, so it was a win-win on all levels. 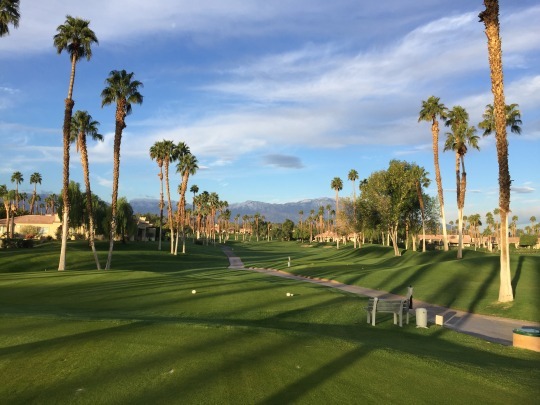 I recently learned that Palm Valley Country Club in Palm Desert was offering limited tee times through StandByGolf during the month of January. They do this from time to time, but the timing has never worked out for me in the past. 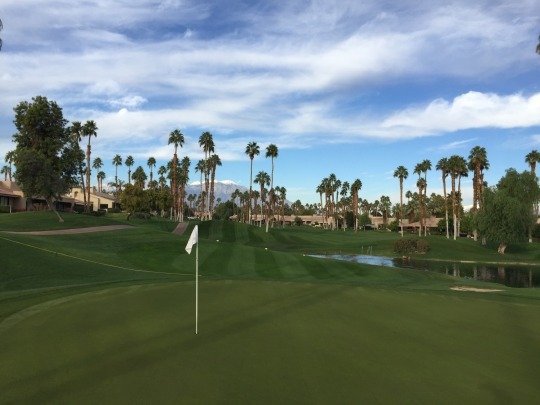 You may or may not be able to get on this course through GolfZing, as well. However, I’ve never had any luck with their private club system, so I don’t even bother trying any more. Either way, I took advantage of this month’s availability and booked a time. Their times are only on Mondays and usually only a handful of spots are available in their shotgun groups (one in the morning and one in the afternoon). I joined the 7:45 shotgun as a single for $75. 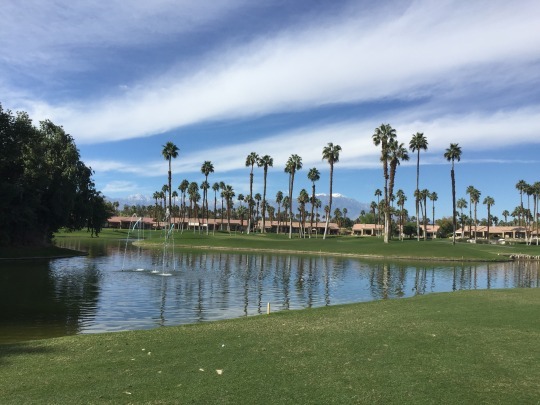 Palm Valley has a very nice overall facility with a big clubhouse and an all-grass driving range. The shotgun itself was a bit disorganized. A lot of people seemed to know what was going on, but for a first-time visitor unfamiliar with the course or procedures, I just kind of had to figure it out. The cart attendant took my bag and told me to check in at the pro shop. That lady gave me a certificate with my name on it, but really didn’t tell me where to go after that. I went back down to the cart attendant, who got me signed in for a cart. I noticed a starter shack between the range and first tee, so thankfully I checked in there and he gave me my hole assignment (14). Otherwise, that was all the information I had and eventually they just announced that everyone head to their tees. 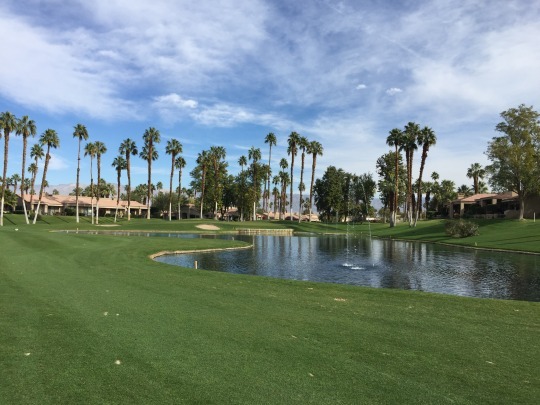 Fortunately, Palm Valley is a rare private club in that it actually has a course map on the scorecard, so I was able to figure out where the 14th tee was on the Championship Course and headed over there. A couple minutes later, the rest of my group arrived, introductions were made and we were off. I played with a fun couple visiting from Kansas City and a single who is not a member, but lives on the course and has played it enough times to give us some helpful pointers. Our group had a lot of fun together. 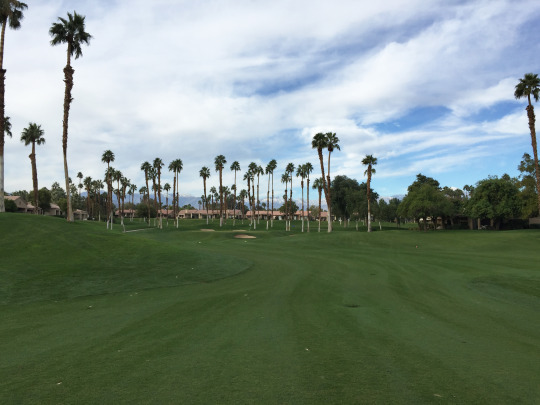 Palm Valley was designed by Ted Robinson, so it has an all-too-familiar feel. 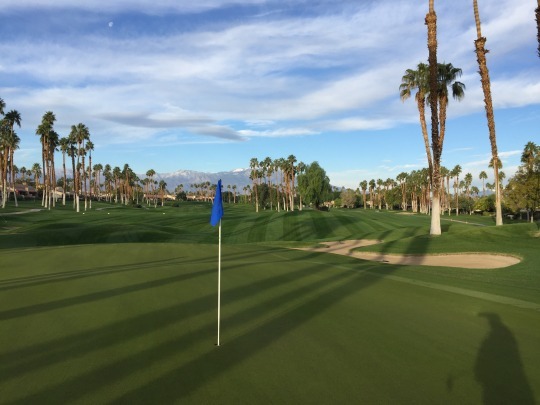 He designed so many Coachella Valley courses and they all have similar elements. 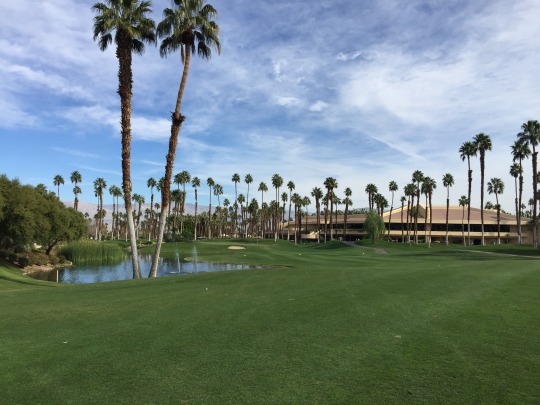 The courses look nice and are enjoyable to play, but they do all blend together quite a bit. 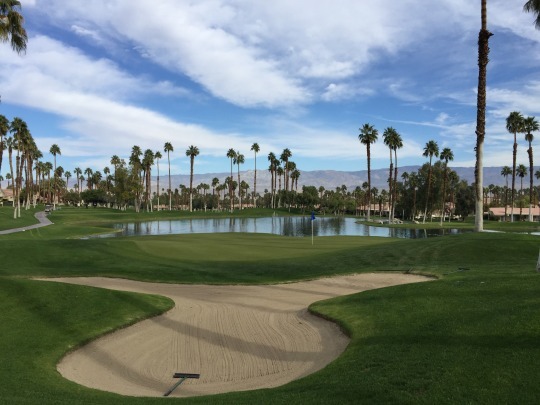 As you might expect, there were a ton of palm trees, water features and the signature rounded wood planking around some water hazards. That said, I was there to play Palm Valley and I enjoyed myself plenty while there. 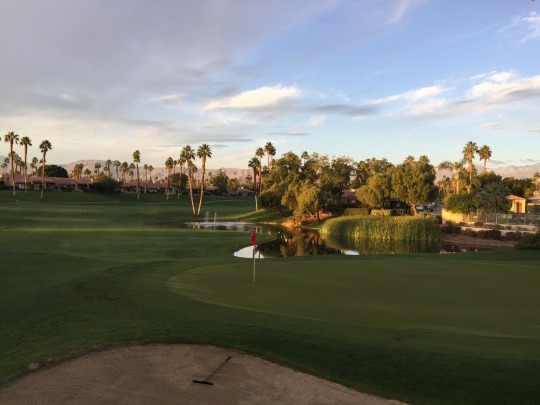 It may not feel like anything new or unique, but it keeps you entertained throughout all 18 holes. I believe there is a water hazard adjacent to every single hole here. Some of the hazards don’t really come in to play on a handful of holes, but most do. 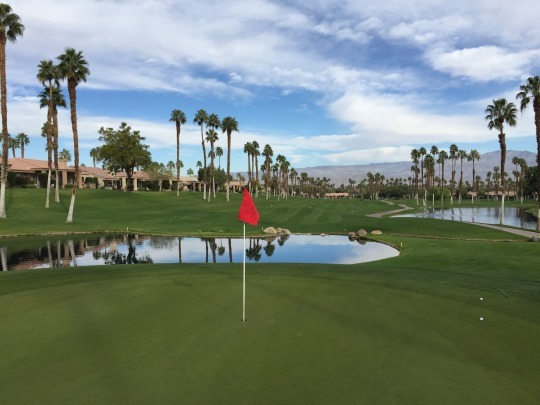 Most holes have very prominent water features that force you to play smart and execute your shots. 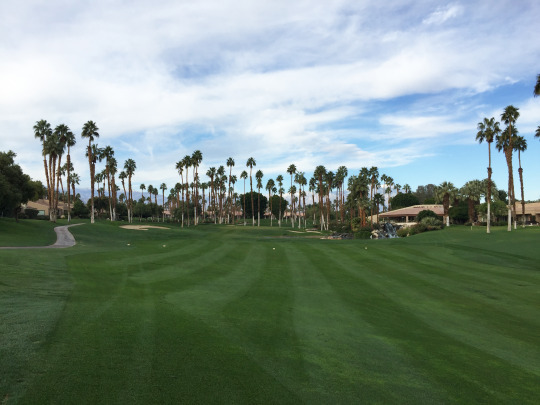 The course itself has nice undulation. Most greens are slightly elevated with false fronts, and the greens themselves have the typical Ted Robinson tiering (though maybe not as dramatic of some of his courses I’ve played). 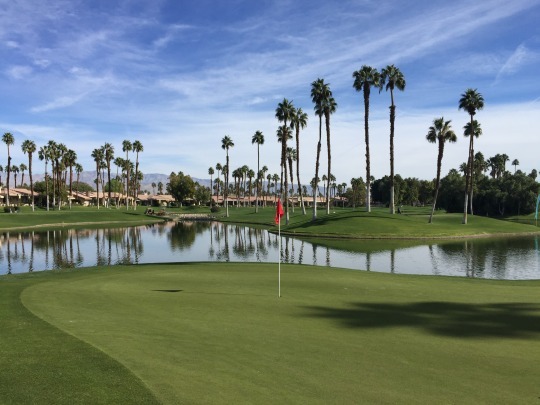 The signature hole is the 11th, which is a mid-length par-4 with an island green complex. It is a massive “island” so you hardly notice it at ground level other than having to walk across the bridge from the cart path. The hole that stood out most to me was the 10th, which a slight dogleg right and has water going all the way up the right side. 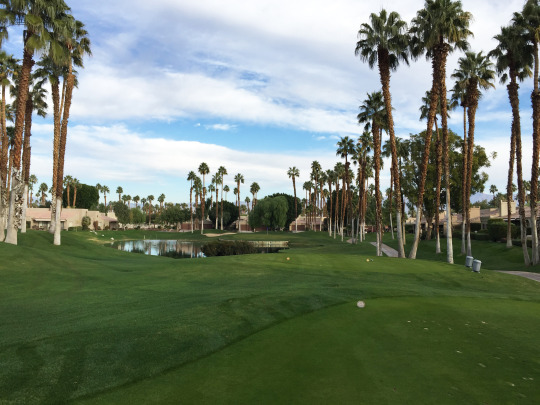 It’s a tricky hole without a lot of room for error on any shot. The par-3s here are all nice, which is no surprise on a Robinson course. 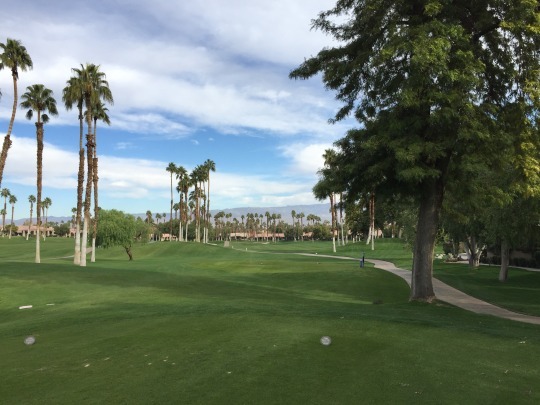 If it was my first time playing a Robinson desert course, I might have been more in awe. Conditions were excellent all around. Tee boxes, fairways and rough were all lush and green. I did encounter a few awkward lies where the grass wasn’t perfectly filled in and the ball would sit down a bit. 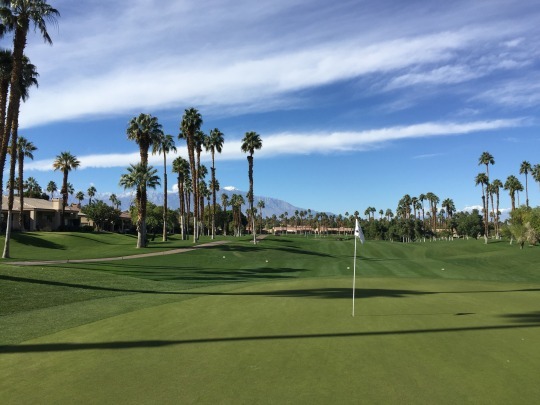 In other words, it wasn’t quite the pure, carpet-like immaculate turf you’ll find at some desert courses, but it looked and played very nice overall. I was in one bunker and it had great sand. The greens were super pure and fast on putts, which I loved. However, they were very firm and nothing would hold. With the elevated surfaces, most balls landing on the green would run off the back. Most balls landing short on the softer fringe with uphill slopes would not release consistently. This made approach shots and chips very tough to judge. They sure were great to putt on, though! 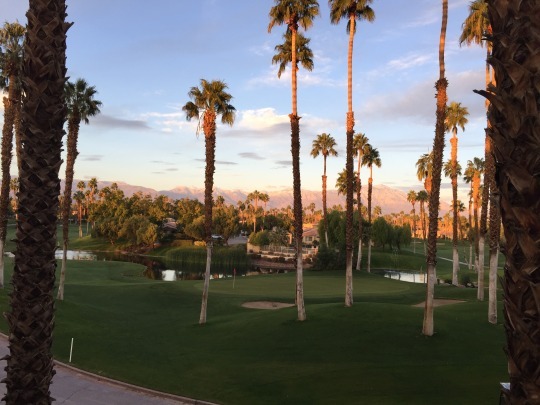 When I ultimately add Palm Valley to my Coachella Valley private club rankings, it will fall somewhere in the middle of the pack. 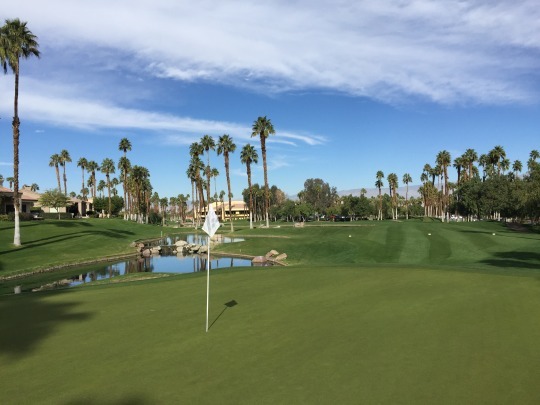 It is a very nice course that offers everything you want in a good desert layout. Excellent conditions, challenging design, pretty aesthetics, and so on. I know I’m a bit more jaded having played so many similar-feeling courses out there. 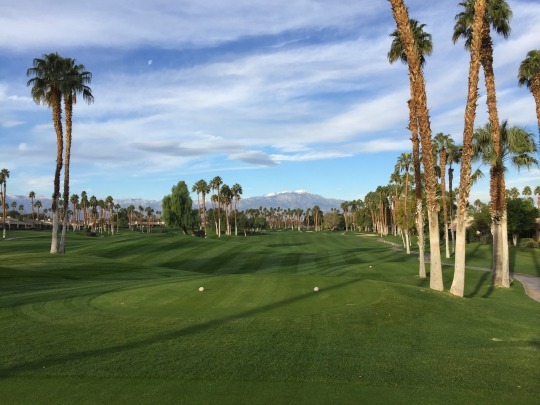 If this were the first course I played in the Coachella Valley, I probably would have been blown away. The standards are also very high in this area, so even middle of the pack will get a very high recommendation from me. It’s yet another one of many excellent courses in the region. 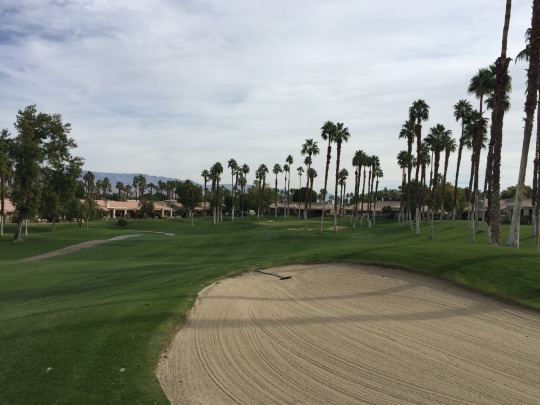 After finishing on the main Championship Course, I went inside to inquire about playing the executive Challenge Course at Palm Valley. I was hoping to check both out while at the facility, especially since Challenge Course public times aren’t available anywhere. Unfortunately, they are oddly protective of the little course here. 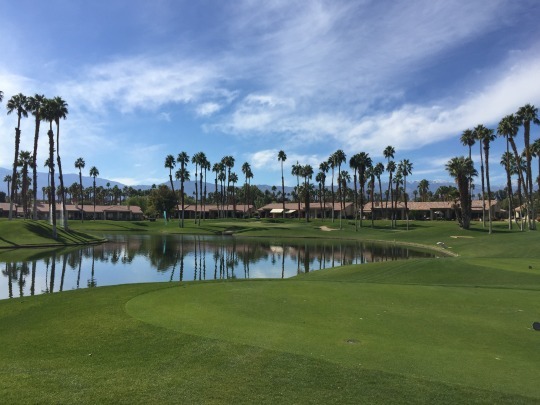 My playing partner said he used to live on the Challenge Course and it hardly ever got any play, but that it was a really fun and challenging layout. I know they had an afternoon shotgun heading out on the main course, but the lady in the pro shop said the small course was also busy that afternoon. I don’t really think that was the case. I believe it was more about not wanting an unaccompanied guest out there. They apparently don’t have any sort of replay rate or anything to make it a possibility for someone playing in one of these public-accessible outings, which is unfortunate. I had a feeling I might encounter some resistance, but I still left the place with a bit of a bad taste in my mouth after an otherwise very enjoyable day. Hopefully, I can figure out another way to get on the Challenge Course eventually. 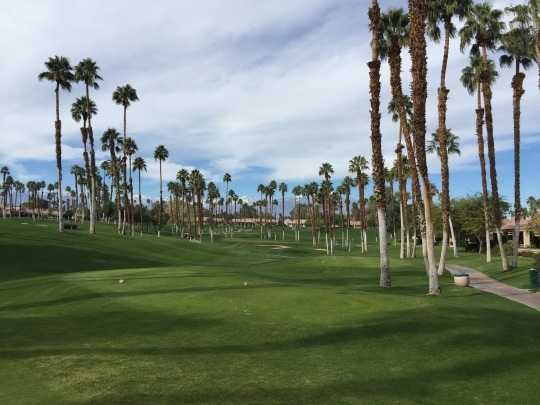 That one will stick in my craw since I have now played the primary course at Palm Valley and the secondary executive course will be the tougher one to access. CA, California, Championship Course, Coachella Valley, Coachella Valley Golf, Desert Golf, Golf, Golf Course Architecture, Golf Course Photography, Golf Course Photos, Golf Course Reviews, Golf Courses, Palm Desert, Palm Valley Country Club, Private Club, Riverside County, SoCal, Southern California, Ted Robinson Sr.